Microsoft(r) Excel is one of the most widely used software's in the world. It is true that most of its users only use it for small calculations and to draw tables, but many use it intensively for advanced calculations and complex projects. These advanced users usually open more than one file at the same time, many times interlinked. If that's your case, start saving time by saving projects and context instead of just files. The common way of saving your Excel work when you need to leave is to save each file on its own. 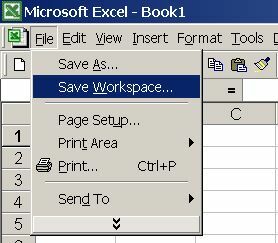 Excel will help you with that by asking to save each changed file if you exit it, before quitting. But all your work context is lost. Next time you will need to work on that set of files, you will need to open them one by one. If they are from different projects, they may be saved on different places on the hard drive, making it hard work to restart. There is, however, a solution: save your entire Workspace: files & context. This includes how windows are open inside Excel, the active cell and so on, as well as a link to each open file. 1) On the File menu, select "Save Workspace"
4) Next time you want to use this set of files, just click the new shortcut: All files will be opened exactly as they where when you last saved them! What if you forget and only save the files after opening a Workspace? Remember, the shortcut doesn't have your files, only a link to them and a copy of your working context. If you save the files, all your data will be updated on them, but the context won't. So, unless your context changed, you won't miss anything. If your context changed, only it will be lost, all important Excel data will, be saved in each file. I need to carry my files to another computer. All I need to do is to copy the Workspace file, right? No, wrong. It is just a shortcut. You will need to copy all files of your working set. Also, the shortcut won't work if your individual files are not exactly in the same disk folder as on the original computer, because the shortcut will expect to find them there. This is a time saving option for use on each PC only. 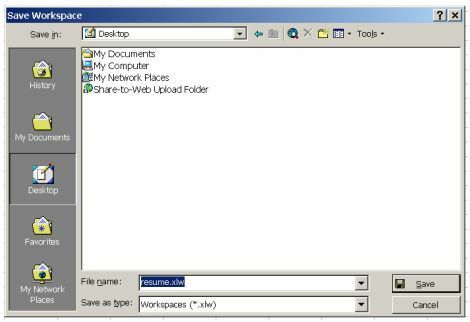 Don't use it to carry context between computers unless you copy all files and place them exactly on the same disc place on the other computer. Check our FREE PC Tips and Tutorials. They will be regularly published and will include some on Microsoft (R) Excel very soon. Better still, subscribe our Email Newsletter. You will be informed when contents updates are made and automatically granted participation on any future promotion.